On April 13th, Cactus Records will be one of the hundreds of stores around the world helping bring music lovers and their local, independent stores together for the annual Record Store Day celebration. 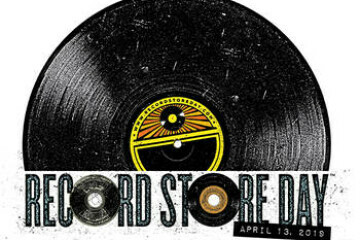 Now in its 11th year, Record Store Day has been described by its creators as "a way to celebrate and spread the word about the unique culture surrounding nearly 1400 independently owned record stores in the US and thousands of similar stores internationally." Traditionally, an artist has been declared "Record Store Ambassador", a post previously held by St. Vincent, Ozzy Osbourne, Iggy Pop, Dave Grohl, Metallica and this year by Pearl Jam. Cactus Records has participated in the event since its first year, April 19th, 2008, featuring live music every hour, giveaways, special sales, and other ways to express their appreciation of their customers. This year, Cactus Records expects their best turnout yet, and also intend to provide the best Record Store Day experience yet. Those of us at Cactus humbly submit that if you're not there, well, we hate to say it, but you might be square. In addition to all the fun, Record Store Day also sees the release of hundreds of limited-release pressings of classic albums, rarities, never-before-released material, and more. The list of upcoming releases is available online and in-store at Cactus Records, and those interested in specific titles are encouraged to call or stop in to request titles. Record Store Day at Cactus Records starts the moment the doors open at 9 AM on April 13th, and wraps up when the doors close. In between, attendants can expect to experience lots of live music, cold snacks from the fine folks at Montucky, killer sales, an opportunity for music hunters to listen to and show off their trophies at the Burn Box at the Rialto starting at 8 pm, and as always, the ever-renewing love Cactus Records has for its oh-so-special and unique customers. For more information about Record Store Day, please go to https://recordstoreday.com, and be sure to check the Cactus Records events page for more info on the live music featured at the event. The staff of Cactus Records and the music-loving community of Bozeman hope to see you there.